A crazy quilt of jingoism. What's wrong with kids nowadays? 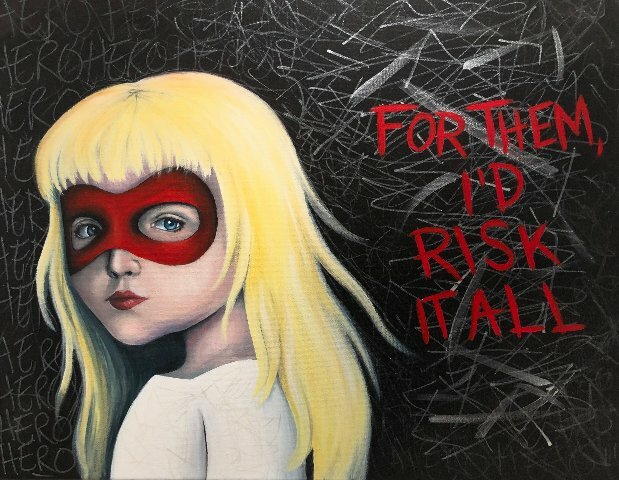 Berkshire Eagke writer and artist Jennifer Huberdeau. A slice of life by Huberdeau. Opening night for the exhibition. 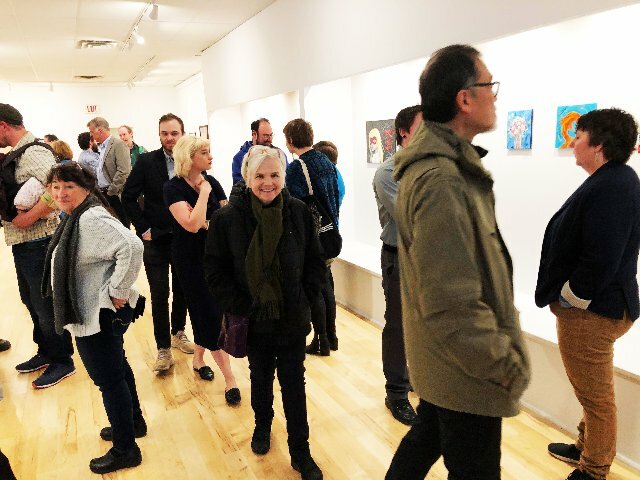 The current exhibition at Gallery 51 “Reconnecting: MCLA Alumni Show” is eclectic, fun, and here and there, somewhat whimsical. There is a range of style and media from painting and works on paper, to sculpture, or varying approaches to photography. Some of the paintings evoke head scratching post pop illustrations. 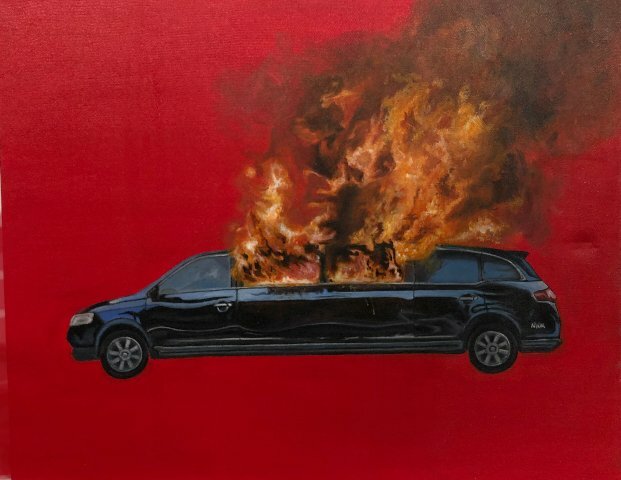 What to make, for example, of a limousine silhouetted against a red background engulfed in flame? Is this a “Carrie” like evocation of prom night gone terribly wrong? Consider the angry looking teenager glaring at us. 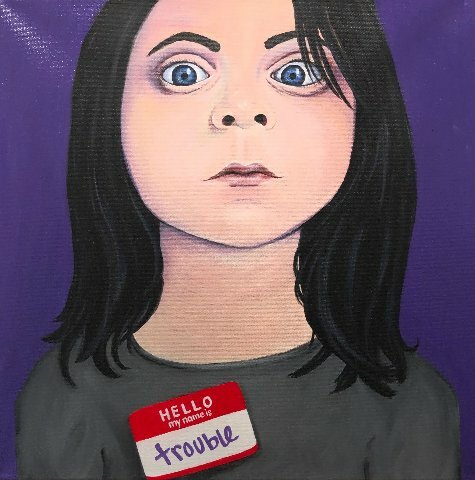 This torso portrait has a name tag that spells “Trouble.” Just what appears to tick her off? What’s wrong with kids nowadays? 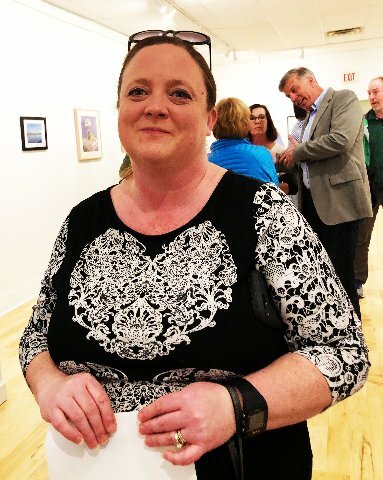 We have followed the work of Berkshire Eagle arts and features writer, Jennifer Huberdeau, through a number of local exhibitions. Here she shows a pair of realist paintings in a thin, scrubby manner. 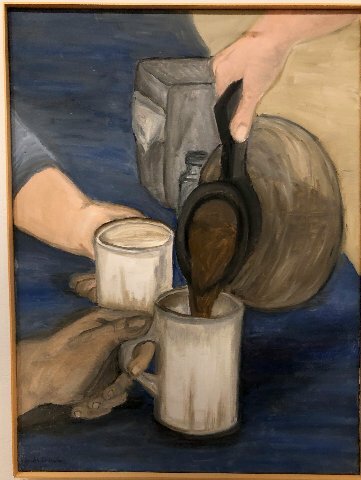 One is set in a lunch counter where a hand pours coffee to outstretched coffee mugs. It is a genre approach to a slice of everyday life. But a hand holding a vial of medicine, and a needle extracting a dose, raises issues about what is going on. Through the gallery and fine arts department Massachusetts College of Liberal Arts is a major contributor to the cultural life of North Adams. This exhibition, through April 21, provides an overview of what emerges from the studio program. It is significant to note that many of the alumni artists have remained in the region. They are a part of the growing critical mass represented by Gallery 51 exhibitions. 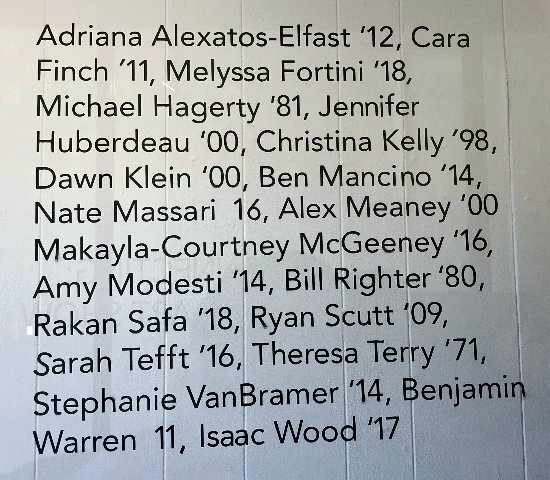 "Congrats to all and we North Adams folks are all richer for Gallery 51-- the institution, directors and staff. Meanwhile, we linger in Firenze."